Our team promotes the University's image and markets to prospective students. 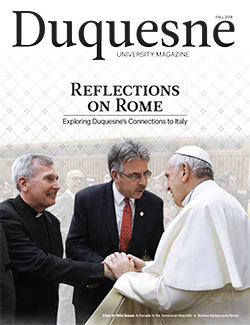 Duquesne’s Office of Marketing and Communications directs the University's media relations, Web communications, marketing, advertising, printing and publications and internal communications. The Marketing and Communications staff is responsible for promoting the University’s image, academics, student life programs and campus-wide news and events. Students and employees can learn more about working with Marketing and Communications through our DORI site.